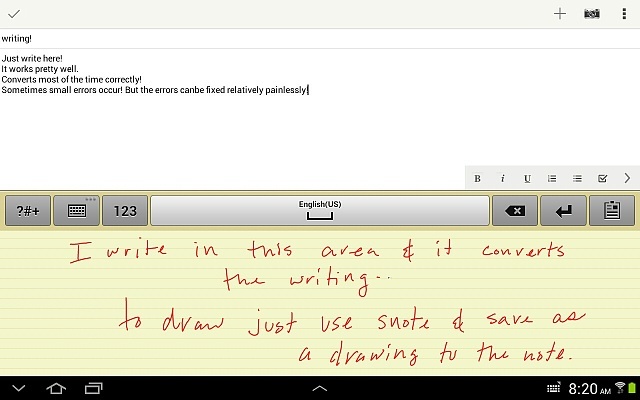 Galaxy Note 10.1 for pen and paper replacement???? I'm in technical sales and have been looking for a pen and paper replacement for years now, closest I've ever come was Grafitti on the old Palm pda's. I don't really need or want handwriting recognition I'm just after an electronic means of taking, filing and keeping handwritten notes. Over the course of a day and several sales calls on customers I have pages of notes. I have been scanning these and storing electronically, I'd like to just write everything on my tablet and save me a whack of work recreating notes electronically and hours of scanning and tagging everything together, only to be then sync'd with my playbook so I have all this with me. I'm never in the office so the more I can do on one device the better. Is anyone using their tablets in this method? How is the batter life over the course of a full workday? All thoughts and opinions would be greatly appreciated! I have used mine a few times for more taking in meetings. S note and One Note can utilize the S pen for more taking. The notes in S note can stay handwritten or you can have the recognition try to decipher them (doesn't always get every word right, especially depending on clarity of writing). The notes can be saved as pdf files for printing or viewing in other apps. Notes are locked when saved, but you just have to choose the previously saved note and tell the app that you want to edit it, and the note will open up and you can continue where you left off. As for battery life, I can only speculate as to the length during heavy daily use as I have never had to do marathon type sessions with it. My guess would be like most devices the longer the screen items on, the faster the battery will drain. The battery is big, so I am not sure. Yes, it has replaced pen and paper for me completely. I am a student who used to print off 20+ pages of notes everyday, but I switched to just downloading the word documents, converting to pdf, and taking notes. The best app for paper replacement is lecture notes. Great developer support. There aren't as many random features as s note, but overall I like it more. The spen is so accurate its crazy. It's the exact same as writing on paper. Whenever I show people they are amazed. Battery life is about 10 hours screen on time. So very, very good. I would get this tablet if I were you, I haven't regretted it at all. Best piece of technology I own - I think my wife gets jealous sometimes. Ditto what everyone else has said about how wonderful the Note is for taking notes. However, I made it a mission to find a way to sync Snotes between Note 10.1 and my Note phone with NO luck. You can send them to any device as a pdf or jpg file, but there is no way to send them for continued editing. I couldn't believe when I mentioned it to customer service a week or so ago and he said he hadn't heard of the problem and since they only had one Note 10.1 in the tablet service department he had no way to test it. sigh. Samsung makes awesome devices, but not being able to share S note is a loss of such potential in functionality. You can share them via wifi direct or bluetooth, I don't remember if that allowed editing or not.... maybe someone else uses that and hopefully will let you know if that works. I use the note for work, as described. I keep many soft copies of manuals and technical papers for ease of use and searching. I also use it to take many notes, using the keypad as the writing surface and putting the notes on evernote, which syncs with phone and work laptop. Battery life is around 10 hours, heavy use through out the day. Keep the display low in the office/meetings and the radios off its amazing how long the battery can last. Once lasting over 20 hours of on time for me. Evernote is the only program that is flawless when syncing between different devices and acting as a back up at the same time. They are adding to its capabilities but there is much more they should add. Please let me know if you have any questions, but thus far this little tablet has been a god send. I am no longer carrying many books and a laptop and technical papers...all in one! Kcour, I tried Evernote and never got it to work as I wanted, taking an S note and being able to write on it with Note 10.1, to phone, and back again, being able to continually write on the same Note. Are you doing this with S notes or something else? And are you hand writing, or using typed text? I think I tried the note feature of Evernote, but not for very long. What do you take notes on and then open on your laptop? Maybe I missed something? I'd really appreciate more details. I use both input methods but like to write in the keypad. It does well converting text. I'm trying to attach a picture, hope it works. I sync through Drop box with no problem. To Kcour and Rolland, If I have to convert the Snote to a jpg, then I can't get it with a different Note device and continue to write on it, right? Or is there something I've missed? and Rolland, I tried Drop box but I think syncing is used two different ways. Some folks mean sync as upload an Snote to drop box, or evernote, or something in the clouds and get it again with either the same device or another where syncing in the cloud is like storage. But whenever I managed to get the Snote to the OTHER note device, (I have phone and tablet Notes) I couldn't write on that Snote. I could open it, but the second I touched the screen, zap, everything would disappear. I'm looking for a way that would sync in the sense that a calendar syncs, or firefox bookmarks, or E books. In the same way a Word document can be edited and read by anything with Word compatible software, I'd like to update an Snote with my Note phone, write on the same Snote with my tablet later, and again, open and write on it with my phone again. Possible? Is it possible if I, gasp, give up Snotes and use a different note app? Maybe if I do the handwriting to typed text and use a Polaris document? Any ideas out there? Anyone? I use the Asus Supermodel. I had to wireless it, but its really great on my nexus 7. S-Note syncs all of your notes to a Sammy 'black box'. If your logged into the same Samsung account it will keep all of your saved notes synced across all of your note devices. Warning: The first ttime I used sync (to sync notes from tab to note 2) it randomly deleted about half of them. Been working fine since then though. [Closed] Draw Lloyd fan art and you could win a Samsung Galaxy Note 10.1!